DIY photo calendar gift idea + a GIVEAWAY! The 2016 version is now available here! Great gifts can be hard to come up with, especially when you’re on a budget. 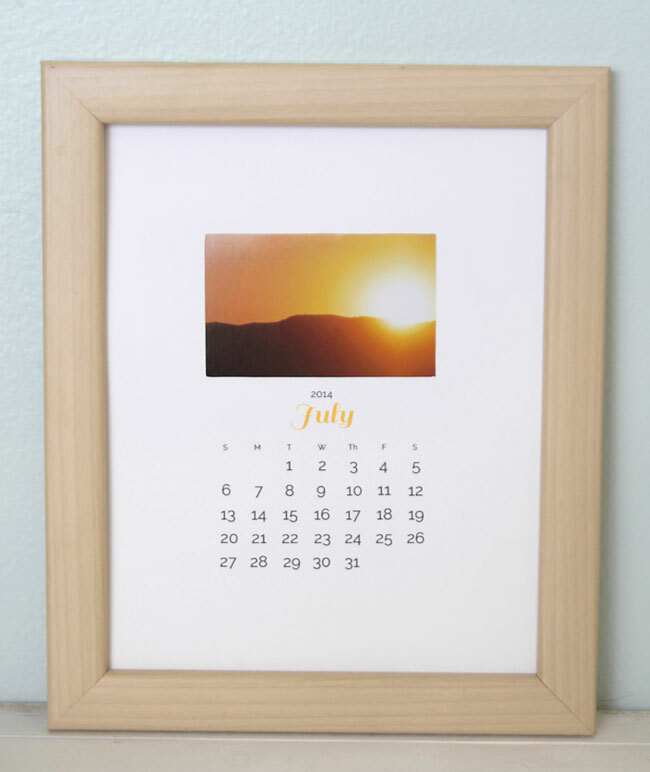 This DIY framed photo calendar is super inexpensive – the whole thing only costs about $5 – and even better, it’s crazy easy to put together (free printables!). 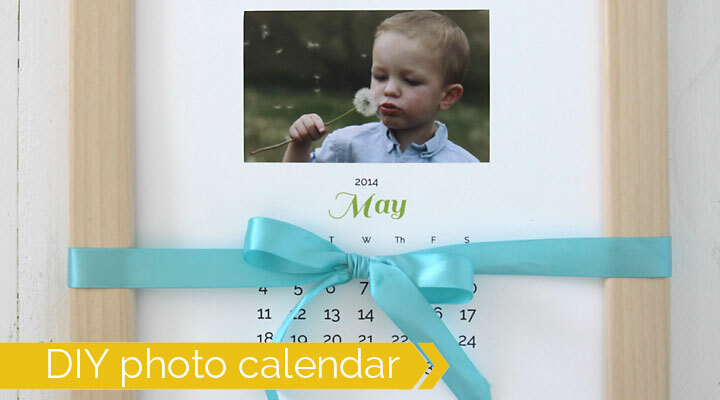 Since you decide which photos to include, you can tailor the calendar to whomever you’re making it for, ensuring it’s a gift they’ll absolutely love. This calendar would be PERFECT for Mother’s Day or Father’s Day, or for grandparents or even yourself! It looks great sitting on a desk or hung up on a wall – it’s just a pretty piece of decor with a clean, classic feel. 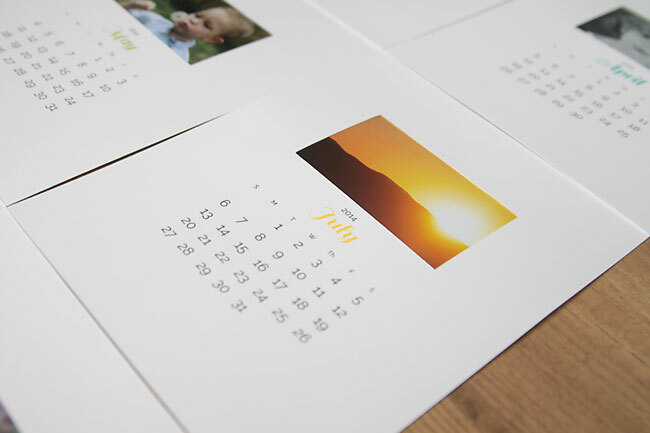 I created free printable PDF calendar pages, which are formatted to print on your home printer to keep costs down. There’s just a small amount of color on each page, so they won’t use up all your colored ink. 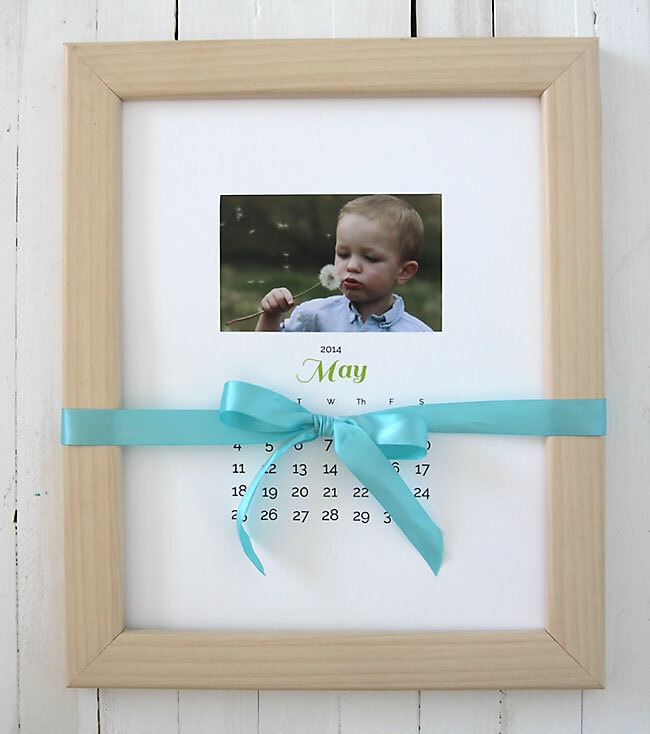 All you have to do is print out a year’s worth of calendar pages, add photos, and tie everything up together with an inexpensive 8×10 frame for a gorgeous gift in under an hour. …or just about anything. 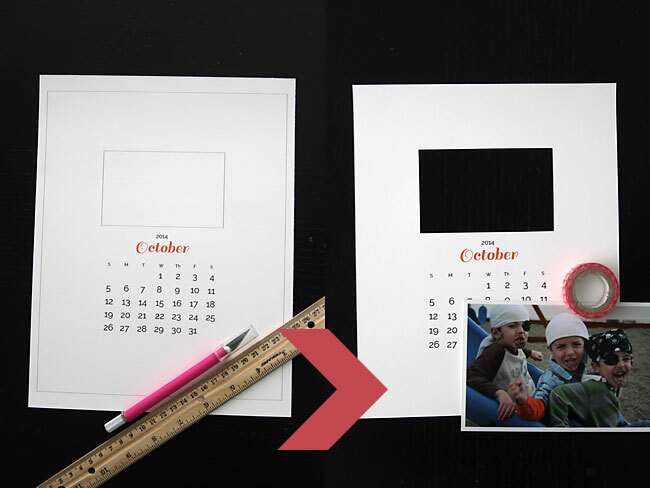 Here’s how easy this DIY photo calendar gift is to put together. First, download and print out the months you’d like. You can download months May-Dec in 2014 by clicking here. You can download the entire year of 2015 by clicking here. Make sure when you print that the scale is set to 100%. When your pages print out, the large box should be exactly 8×10 inches. As you can see below, there are two boxes on each page. Trim off the portion outside of the large box, and carefully trim away the portion inside the small box, which is your photo window. Use washi or masking tape to tape a photo behind the photo window. I used 4×6 prints for this. The actual dimensions of the photo window are 4.5 inches wide by 2.5 inches tall, meaning about 3/4 of an inch on all sides of the photo will not show through the window, so keep that in mind when you’re choosing which photos to use. 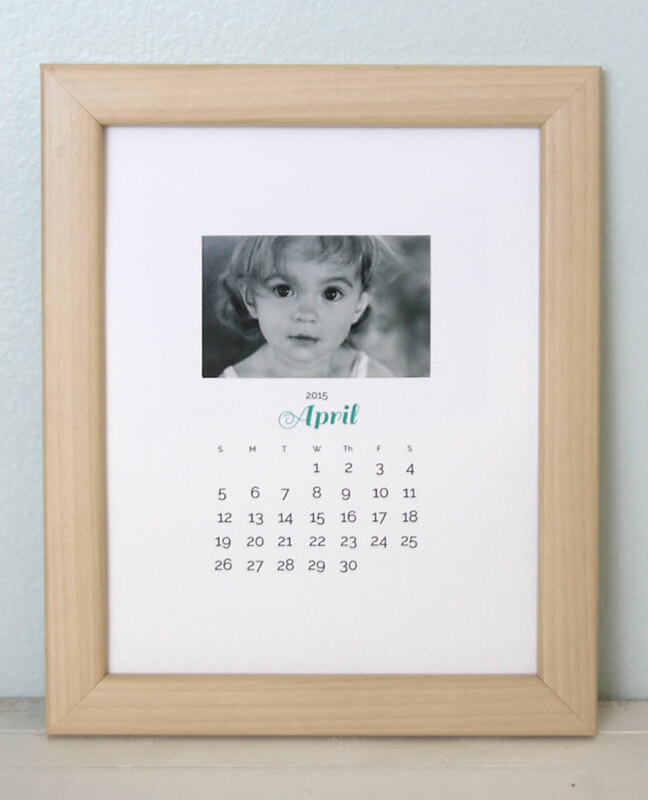 Place your completed calendar pages in an 8×10 frame, and you’re done! The recipient can simply switch out the pages each month. I would love to win the tablet so I can give it to my Mother-In-Law for her birthday. Hi! Just found your blog today via Clean Mama. Curious as to what frame you used? So simple and so easy! Love! Thanks! Hi Jill! The frame was one I got years and years ago from Target for just a few dollars – but I think IKEA sells one that’s pretty similar! I would love to win that tablet because it looks great and the one i have usually is in the hands of my two daughters. I would love the Surface because I’ve been wanting a “tablet” but unsure about not having a keyboard and this looks like the perfect compromise!! Great for my sewing, cooking, and crafting projects!! Would be so exciting to win something! My family would love having this tablet! I think I will be making one of these for my grandma. She loves getting new pictures of her grandbabies. I would love to have an up to date tablet to use on a daily basis. Sharing one laptop between 2 people is hard! I am always on my laptop or Kindle. This would be the best of both worlds…PLEASE! Fantastic! I’m glad it’s working out for you – thanks for letting me know. I’ve been waffling over tablet choices for a while now – if I were to win one, that save me from having to pick – ha! This is beautiful. I’m definitely using it for Mother’s Day this year. I’m on the hunt for a frame exactly like this! If you don’t mind me asking, where did you get it? My frame is super old – at least 10 years. I got it at Target way back when but obviously they don’t have any like it anymore. I think IKEA might have one that’s similar. Good luck! I really like your project, it’s clean and minimal and your calendar is very well balanced. Is it possible for you to provide the same calendar style for 2016? I’s like to use it for Xmas gift this year. Hi!! I absolutely love your calendar and would like to make it for this year’s Mother’s Day. Yours is the only calendar I liked on Pinterest! Any possibility that you have the template for January till April 2016? Thanks so so much!! Is it possible to get the calendars for 2016 or in an editable format so I can change them to any given year?? Just found this on pinterest and it would make a perfect Christmas Present. Hi! Love love love this idea, any chance you will make this for 2016? Would love to make these as holiday gifts. Thank you!! It’s coming! The 2016 version will be up on the blog in a couple of weeks. Hi there! Will you be posting 2016 dates any time soon? I think this gift would be great for my Mom for Christmas! Yes, I think it’s scheduled for Monday so check back! It’s not posted yet….. will there be one? Because I think my grandmother would love this. This is so cute! Do you have downloads available for 2018?